Li Na Wins A Second Grand Slam At Australian Open : The Two-Way The Chinese tennis star defeated her Slovakian opponent, Dominika Cibulkova, 7-6 (3), 6-0. It's Li's second Grand Slam title after she won at the French Open in 2011. Li Na of China celebrates after defeating Dominika Cibulkova of Slovakia during their women's singles final at the Australian Open tennis championship in Melbourne, Australia, on Saturday. China's Li Na has won her second Grand Slam title in a women's singles victory over Slovakian Dominika Cibulkova at the Australian Open. "Cibulkova arrived at their matchup having defeated a series of favorites along the way. Cibulkova defeated the No. 16 (Carla Suarez Navarro), No. 3 (Maria Sharapova), No. 11 (Simona Halep) and No. 5 (Agnieszka Radwanska) seeds, in that order, to reach the final." "On Saturday at Melbourne Park, though, Cibulkova ran into the one seed she would not topple with power groundstrokes. Li overcame a shaky first set to win easily, 7-6 (3), 6-0. It marked her second career Grand Slam title, after her French Open triumph in 2011, and it came despite a match-point saved here in the third round." "Finally I got her [the Australian Open trophy]," Li was quoted by the BBC as saying. "The last two finals were very close. "Now I have to thank my team. Thanks to my agent for making me rich, thanks a lot," Li joked. "Li opened the final by breaking Cibulkova, holding, then getting a breakpoint chance in the third game. But Cibulkova held, and then broke back in the sixth game thanks to Li's consecutive double-faults. Li broke in the 11th game and had a set point serving for the set in the 12th, but lost three straight points to ensure it went to the tiebreaker." 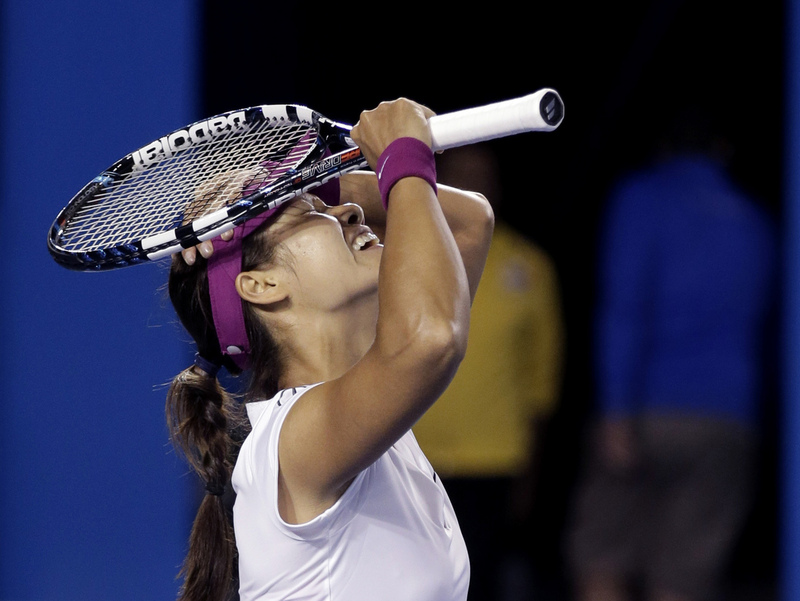 "As Li began her roll in the second set, someone yelled — before Cibulkova served — 'C'mon Li Na, bagel her!'" "A half hour later she was holding up both thumbs to the crowd, and holding back tears as she hugged her Slovakian rival at the net. She went immediately to the side of the court to shake hands with her coach [Carlos] Rodriguez."